Magic Spell is by a Clydesdale stallion out of a saddlebred mare. Magic Spell did indeed win our Horse of the Year 2002 Trophy and prize money for dressage at Training level!!!!! for some year-end award with you?????????? 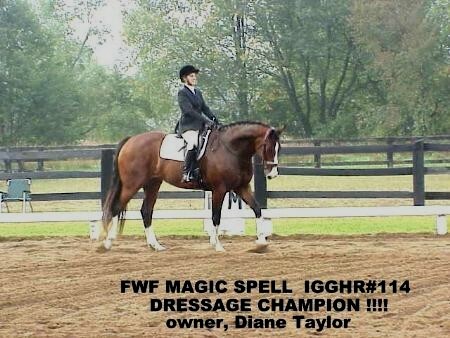 More show results: Thomett Stables Hunter Show, Ada, Michigan. Novice Hunter Cross Poles, 3rd. Next show in two weeks (dressage). Hi Fredericka, Magic Spell did very well at her first show of the season.We were the CHAMPION HIGH-POINT for the USDF/Senior division. Just thought you would like to know that Magic Spell was the champion at our last American Dressage Association show in Ada, Michigan. She also received the High Percentage award with a 72.63%. She is the BEST horse. She continues to be more of a puppy than a horse, loving to be around people. She is dependable and so much fun!!! She loves to jump and we will begin more hunter shows later this summer and next year. Hope all is well on the farm. Write back if you can.